← Want a signed copy of The Girl in the Road for the holidays? Read on! 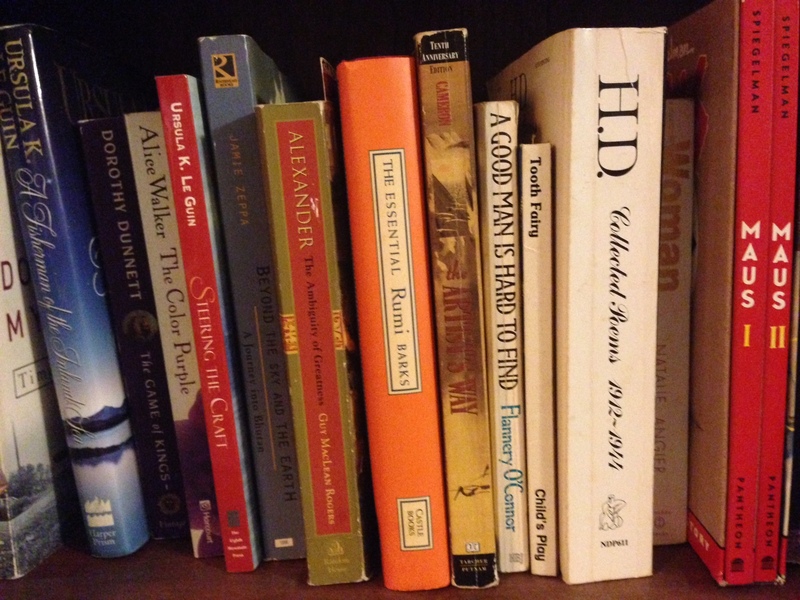 Photo: a bookshelf in my study. Here’s how insidious unconscious gender bias is: I don’t realize that I do it, too. I keep track of all the books I read, and you know what? No bueno. It was 30/70 in the past year. How did that happen? Not because I was intentionally sexist, but because the entire system is sexist, and disproportionately encourages and buys and publishes and markets and reviews and sells books by men, and it takes deliberate overcompensation to correct for that. For anyone. Including me. Including all the editors at literary magazines tracked by VIDA who still think they’re somehow not part of the problem. I didn’t think I was part of the problem, but the numbers show that I am. I have to work to correct that. So in 2015, I’m going for gender parity. First up: Betsy-Tacy by Maud Hart Lovelace, for a very important reason that I’ll chronicle at a later date. I’m excited. I noticed this same self trend in the previous two years, and this year committed to 50-50. Been a good year. Interesting idea! I went back and reviewed what I have read in 2014. So far, the lady authoresses are leading by two books — including yours! Yay! Hmmm….that was supposed to be a smiley of exasperation, but it got lost in translation.